Such was the statement made by a non-Muslim professor in a 400-level undergraduate class on the history of science. It seems that the rate of discovery and advancement in science achieved by the Muslims was quite impressive and has yet to be replicated. What was it that they were doing that allowed for their fast progress? The teacher in me immediately thinks about their education system, and the neuroscientist in me wants to examine the factors involved in shaping the brains of such a civilization. Interestingly, many Muslim religious scholars will say something about how the Muslims were the leaders when the Qur’an was the centre of their education, and only when they abandoned the Qur’an that they lost their reign. The amazing thing about this is that while Muslim religious scholars are typically talking about spiritual and moral realities, there is actually a material reality to what they’re saying, which takes place in the brain. A quick disclaimer here: The list of all that is affected in the brain by the Qur’an and how that can influence other functions is quite exhaustive. But in the interest of keeping it short, I chose some major areas to present in this article. Before getting into the brain and how the Qur’an changes it, one should be familiar with how traditional Muslim education took place. In case you’re wondering where I’m getting this from, it’s from reading the biographies of major figures of scholarship in the traditional Muslim world such as Ibn Rushd, Ibn Sina, and others. This is also based on my personal experience and what I have been told by some of my teachers. The very first thing taught to an aspiring student was the Qur’an, which had to be memorized completely. Unlike anything else encountered in spoken Arabic, Qur’an recitation is a very specific science. Local dialects of Arabic or different ways of pronunciation are not permitted when reciting the Qur’an. In fact, part of learning the Qur’an is learning what is called in Arabic tajweed, which means elocution. The very first thing the student must do is replicate exactly how the teacher is reciting the verse. This refers to where individual letter sounds are being generated in the mouth and throat and where the tongue is to be placed exactly. Once this is done, the student writes the verse on a wooden board in the ‘Uthmani script, which follows different spelling rules than regular Arabic writing. The student then takes his board and goes away to memorize the verse. A typical memorization session for a beginner starts with repeating one verse multiple times as it is read on the board to also memorize how it is spelled using the ‘Uthmani script. The next day the student reviews the verse several times before returning to the teacher to receive the following verse. After repeating it with the teacher to ensure exact replication of sound and pronunciation, the student writes the new verse and goes away to begin a new memorization session. The third day begins with reviewing the first verse one final time, followed by the second verse several times before going to receive the third verse. On the fourth day the first verse is not reviewed any more as it would have taken hold in memory, and the second verse takes its place for being reviewed while the third verse is repeated several times before going to receive the fourth verse. At the end of the week is a complete review session for everything that was memorized in the previous days. As the days pass the capacity for memorization increases and the student is able to take on several verses or even pages at a time instead of only one or two verses. The writing using ‘Uthmani spelling continues, as well as the review sessions. Eventually, the whole Qur’an having more than 6,200 verses is memorized word for word with their specific pronunciation and ‘Uthmani spelling. Now the hard task begins as the student works to review all the verses on a monthly basis so as to not forget them. This usually means taking the 30 parts of the Qur’an as it has been divided to facilitate memorization, and reviewing one part everyday until all 30 have been recited by the end of the month. It should be mentioned here that the Qur’an has 10 different modes of recitation. This refers to the placement of diacritical marks on the words and how certain words are pronounced. Some students take this task on and memorize the Qur’an in all the different modes of recitation, which requires a very careful attention to where the pronunciations are different so they’re not confused with each other given how subtle they sometimes can be. There are a couple of important qualities about the Qur’an that relates to how it sounds. Verses in the Qur’an rhyme and change rhythm often, which gives a pleasurable effect to the listener. Furthermore, as one recites, they’re supposed to sing it rather than simply read it. In fact, the very practice of Tajweed (elocution) forces the reciter into a singing tone as they enunciate the words of each verse. A final note to bring up is in regards to the Arabic language and writing in ‘Uthmani script. Part of studying the different modes of recitation requires the student to write not only in an unusual spelling, but also to exclude the diacritical marks from the words. This would allow the student to learn the variations of recitation without having the diacritical marks visually interfere with their memorization of different modes of recitation. Moreover, the grammar of the Arabic requires the proper use of diacritical marks in pronunciation so as to not confuse things such as the subject and predicate. This means that the one learning the Qur’an must always keep track of how the words are enunciated so as to not alter the overall meaning of the verse. How all of this relates to the brain is quite impressive. The brain is recognized to be a malleable organ that can change its connections and even its size of certain areas based on how active they become. Understanding how involved the brain is of someone learning the Qur’an using the traditional Muslim method can explain how they were able to achieve such success in their knowledge endeavours. While learning the Qur’an, the careful attention to listening and pronunciation of verses stimulates an area of the brain located in the temporal lobe. 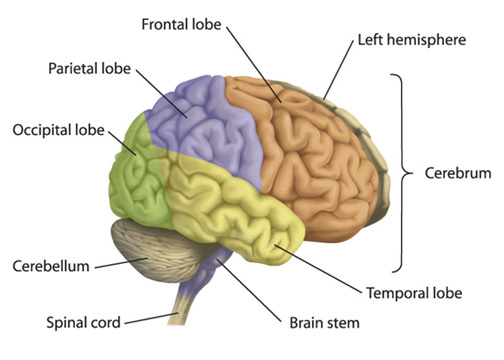 The temporal lobe is also where the hippocampus is located, which is the memory consolidation centre. It’s also the brain region activated for processing of musical sounds such as the case when the Qur’an is recited. Moreover, it becomes involved when the student engages in handwriting exercises similar to the ones on the wooden board. Where this matters is that this is the part of the brain whose activity levels and capacities have been correlated with a person’s aptitude for learning new information. The more activation this area receives, and the more involved this activation is such as the case with the Qur’an, the better and more efficient it becomes in its functions for learning and memory. The parietal lobes are also quite heavily engaged as one learns the Qur’an. The left parietal lobe deals with reading, writing, and functions in speech. It’s also the part whose activity is important for maths and logic problems. The right parietal lobe handles speech tone, which is related to elocution. It’s also responsible for visuospatial relationships and understanding facial expressions. The front part is responsible for the sense of touch discrimination and recognition, which is active during handwriting. The back part plays an important role in attention. Both lobes are also activated during skill learning tasks. Overall, having parietal lobes that have been well activated translates to better logic and maths-solving skills, eloquence in general speech, better ability at reading emotional states from facial cues, improved attention, and enhanced capacity for understanding visuospatial relationships. This last one can explain why Muslims were so good at astronomy. Other brain regions the activity of Qur’an recitation strongly activate are the frontal lobes and the primary motor cortex. 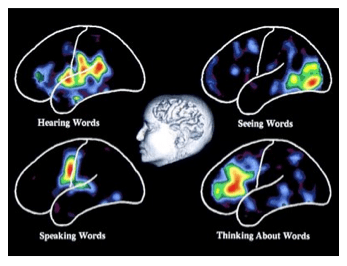 The frontal lobes activity deals with higher order functions, including working memory, memory retrieval, speech production and written-word recognition, sustained attention, planning, social behaviour, in addition to others. For example, as the student is reading the ‘Uthmani script, his brain must quickly decide on the proper pronunciation of the word, which without the diacritical marks means it must be distinguished from other possibilities that include not only wrong words, but also wrong enunciation depending on the specific recitation he’s using out of the 10 valid ones. The amazing thing about this is that the brain after practice will do these things without conscious control from the student. This trains the area of the brain responsible for inhibition, which is important for social interaction. Children with ADHD have been shown to have this area to be under-developed. Given the Qur’an’s content that for example includes descriptions of individuals and places, it activates the occipital lobes, which are involved in generating mental imagery. This brain region is also important in visual perception. Becoming active as a result of generating mental imagery indirectly improves visual perception capacities since the area activated is within the same region. The Qur’an is also rich in its content for history, parables, and logical arguments, all of which recruit different areas that become more efficient and better connected as they are continually activated due to the consistent review sessions. Putting all this together, it’s no wonder Muslims were able to make such vast contributions to human knowledge in a relatively short amount of time, historically speaking. After the aspiring student during the height of Muslim rule has mastered the Qur’an, his education in other sciences began by the time he was in his early teenage years. Given the brain’s malleable nature, the improved connections in one region indirectly affect and improve functions in adjacent locations. The process in studying the Qur’an over the previous years has trained his brain and enhanced its functions relating to visual perception, language, working memory, memory formation, processing of sounds, attention, skill learning, inhibition, as well as planning just to name a few. Now imagine what such an individual will be able to do when they tackle any subject. It makes sense how someone like Imam al-Ghazali can say he studied Greek philosophy on the side during his spare time and mastered it within two years. What was the Muslims’ secret for their exponential rise in scientific advancement and contribution to human knowledge? Literally, the Qur’an – when it was the centre of their education system.